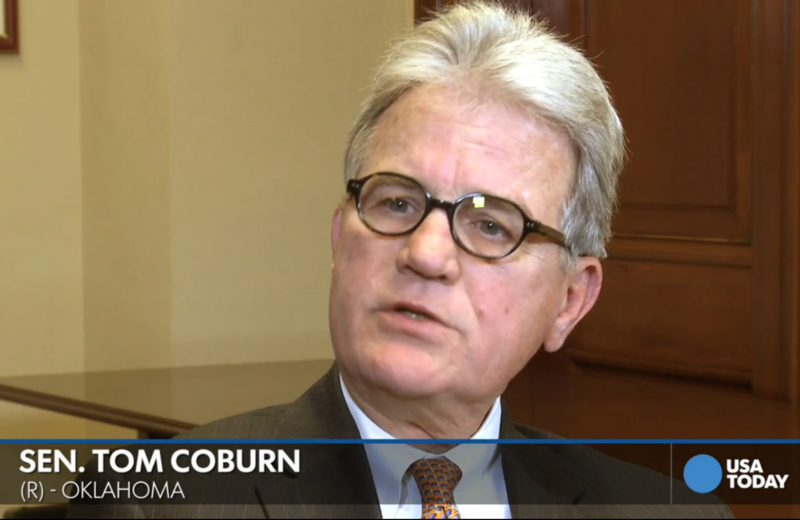 Retiring Oklahoma Senator Tom Coburn, in an interview with USA Today’s Susan Page yesterday, seemed to both warn about and threaten white violence against President Obama’s executive action on immigration reform, saying the president’s speech Thursday night could provoke “violence” and “anarchy.” He even suggested that the reaction could parallel the demonstrations and violence in Ferguson, Missouri. Page asked what will be the reaction of Republicans in Washington, and Coburn acted as if it’s not the GOP that will be upset (‘cause, you know, they’re such a even-keeled bunch: Alabama Representative Mo Brooks actually thinks Obama could end up in jail, as well as impeached). Rather, it’s all those regular folks out there who will be terribly disappointed that the president isn’t working with Congress. As Josh Marshall pointed out at TPM, Coburn’s warnings about street violence over allowing the parents of American-born citizens to stay here without fear of deportation were logically challenged in the first place. The protesters in Ferguson are outraged by a direct government action, the shooting to death of an unarmed black teenager. Any violence over Obama’s executive order would mean people taking to the streets in anger over a government inaction—its refusal to actively deport people already living in the US for years. Coburn’s remarks should also be seen in the context of the 2016 elections. Obama’s immigration reforms, modest as they are in reality, would further the perception driven home by Fox News, hate radio, and millions of dollars of GOP advertising that Obama only helps the poor and minorities. Obama saying that if he had a son, “he’d look like Trayvon” Martin, Eric Holder’s intervention in Ferguson, and even Obamacare, which actually helps more whites than blacks but is believed to do the exact opposite by many whites—all are grist for that mill of resentment. Add to that changing immigration practices by executive order, and the right may be able to orchestrate a backlash of epic proportions against a Democratic nominee. In politics, what is true is never as important as what works. UPDATE: This is even more hysterical, in both senses. Anti-immigrant and voter-suppression superhawk Kris Kobach, the GOP Kansas secretary of state, says that once Obama replaces “American voters with newly legalized aliens,” gets “a locked-in vote for socialism,” and does away with the rule of law, we could be in for a spate of “ethnic cleansing,” presumably by Latinos of Americans—though he didn’t quite specify what that “American” ethnicity might be.